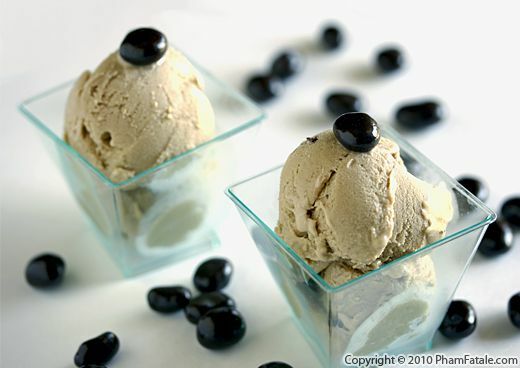 Vietnamese coffee and ice cream are two of my family’s favorite foods, so it made sense to try and make some at home. Since one of the girls is allergic to eggs, I made the ice cream eggless. 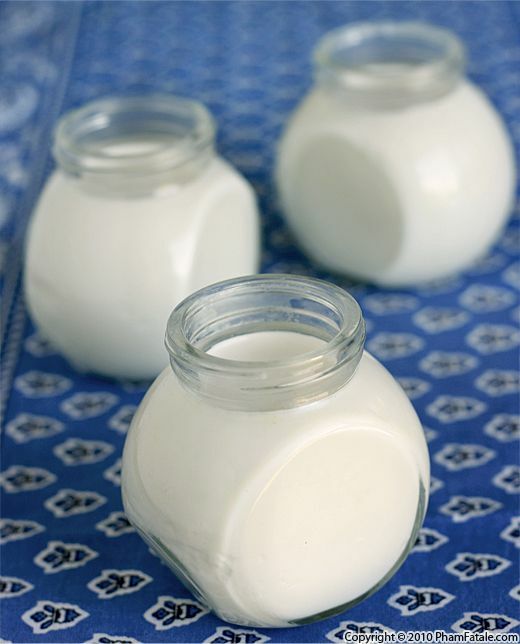 The ice cream base is made with half and half and sweetened with condensed milk. Usually Vietnamese-style coffee is made with boiling water, but the half and half produces a much richer mouth-feel. Coffee made with water could make a nice sorbet, but that’s a different recipe! As I mentioned previously, making Vietnamese coffee (cà phê sữa in Vietnamese) reminds me of mon papa (I usually call him Papounet). When I was a little girl growing up in Paris, I would make coffee and bring breakfast to my dad every morning. Making the coffee for the ice cream took me back in time. If you cook long enough, food will have that power over you too. Lemongrass chicken (cơm gà xào xả ớt) is a very delicious and easy Vietnamese meat dish to prepare. 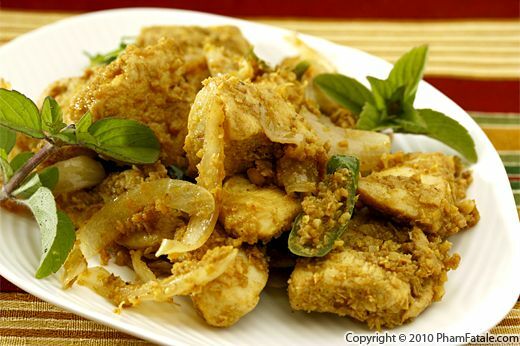 To start with, the chicken pieces are marinated overnight to guarantee optimum tenderness. The next day, I prepare a mix of spices made of finely chopped lemongrass, sugar, chili and salt. The dish is completed by combining and sautéing the ingredients in a fry pan. I love the fragrance and taste of lemongrass. It has hints of sweet lemon and a touch of ginger. 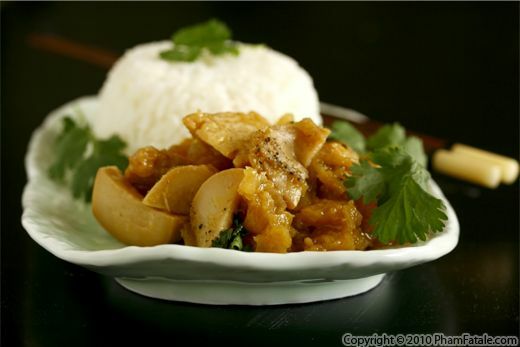 It really adds a distinctive flavor, but this dish can easily be ruined if the lemongrass isn't ground properly into a fine, moist powder. It’s important to take time to thinly slice the stalks of lemongrass before grinding them. In case you’re interested, growing lemongrass is very easy. All you need to do is trim it often. My husband Lulu planted 4 "bushes" of lemongrass a few years ago. I gathered 4 stalks from the garden and made both lemongrass tofu (tàu hủ xả ớt) and lemongrass chicken for dinner tonight. The plants are quite prolific, and if you use a lot of lemongrass in your cooking, it’s worth planting some in your garden. This dish is a vegetarian version of the Vietnamese dish called "cá kho tộ", which is braised fish simmered in caramel sauce. Instead of using cá kèo (a dark-scaled small fish that is very popular in Saigonese cuisine), I stuffed tofu in nori sheets to resemble the look and taste of seafood. 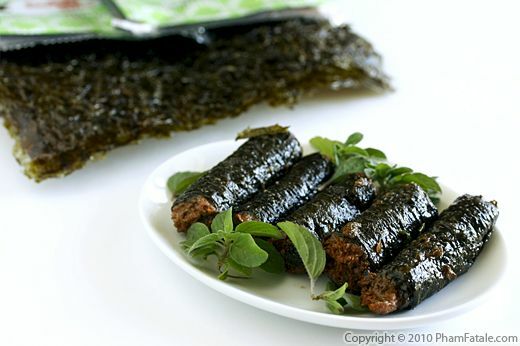 Once wrapped, the nori rolls are simmered in a sauce made of coconut and soy sauce. Even though the real fish dish is cooked in a claypot to perfectly sear the fish, for the vegetarian equivalent I don’t think it’s necessary. I used a regular deep non-stick pan. I served the vegetarian fish with thin vermicelli noodles and a banana blossom salad. The more authentic version calls for rau răm, which is a Vietnamese aromatic herb that is an acquired taste for those who are not familiar with it. My husband Lulu is not a big fan, so I garnished it with African basil from the garden. If you're planning to cook for vegetarians, this meal is perfect; the texture of firm tofu resembles fish without its strong aroma. If you like this recipe, you'll be happy to know that there are a lot of similar vegetarian equivalents to traditional Vietnamese dishes that have been developed for the Buddhist vegetarian diet. I'll post more recipes resembling seafood such as shrimp and other fish dishes soon. Sorry for not posting yesterday'; our internet was down . Pineapple tofu with king mushrooms is a great dish for both vegetarians and "meat-atarians", as my little munchkin would say. King mushrooms, also known as "abalone mushrooms", have a very meaty, chewy texture that I love. They complement the pineapple really well. If you can’t find fresh pineapple, canned crushed pineapple will work fine. I made a sweet and sour sauce using canned pineapple and dipped the fried tofu in the sauce with the mushrooms. Even if you are a "meat-atarian", it’s worth working some vegetable dishes into your diet. It’s good for your health, and if you try recipes like this one, it will be good for your tastebuds as well. Page 12 of 47 pages.